GALA Choruses are becoming known for outreach projects in our own communities and beyond. Below you will find outreach stories and testimonials, information about touring, school outreach and plenty of templates and resources shared by our member choruses. Harmony: A Colorado Chorale in Denver created a satellite chorus in Fort Collins. The two choirs share a director who commutes for rehearsals in each city. Concerts are performed together. An small group from the New York City Gay Men’s Chorus has created a musical partnership that supports HIV positive women from West Indian and other Spanish and French-speaking countries. One Voice Mixed Chorus has been performing in schools for over 15 years. Check out their story and resources to help you set up your own school performance program. The documents below can assist in organizing and planning your outreach tour. A pre-tour site visit is crucial. Use this form to track the details of each performance venue. To assist with singers requests for tour scholarships. Make sure you have all tour agreements in writing with your hosts. Follow up with each hosting organization. Their feedback important for planning future tours. 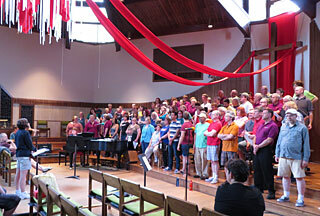 Several GALA Choruses current perform regular concerts and collaborations in schools. This video describes the OUT in Our Schools program designed by One Voice Mixed Chorus in Minnesota. When performing with minors make sure that your adult singers read and understand your own guidelines for protecting youth and for protecting your organization. If you have children traveling on tour with their parents they should sign a waiver. One Voice Mixed Chorus was recently featured in a public television documentary featuring their outreach in greater Minnesota. Watch the short 6 min version or the entire 26 min documentary. Experience GMCLA on their outreach tour to Russia.